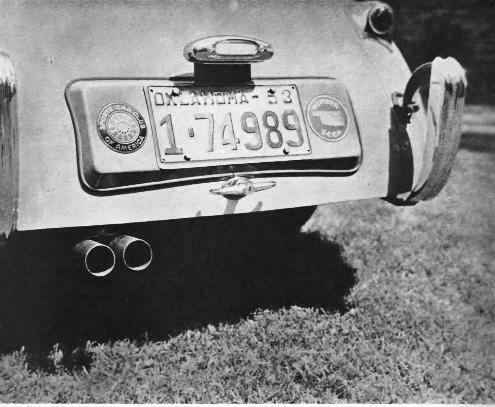 Oklahoma Region member Pete Young wrote a 6,000 word article for the September-October 1953 issue of Sports Car. Pete's article gave a blow by blow description of the first four years of the Region. It appears to have been paraphrased by Bud Berg in 1961 and Margaret England in 1971. With character recognition we have copied Pete's tome in its entirety, and have split it into three parts; 1950-51, 1952 and 1953. Chances are you haven’t unless you’re a member of the Oklahoma Region, or have had the pleasure (?) of participating in one of our events. So, now you know. We don’t reckon to be the biggest Region in the country from a membership standpoint, but as near as we can determine we’re one of the busiest, even if it is only for our own amazement. We have had a planned event a month for the past two years, with a number of spontaneous ones thrown in. This past year we have had an average of 30 cars for every event with a high of 40. About a third has been American iron because we encourage our members to invite interested and interesting friends as guests and potential members. We don’t care what they drive a long as they enjoy the sport. Besides, since we have no Regional dues, the guests help keep us in the black. Our usual event fee is one buck for members’ cars and double that for guests. If a guest becomes real interested. even an Okie can figure that it’s cheaper to join. Our SCCA membership list now totals 46. Back in October, 1950, Ray Utter, who lives in Shawnee. Oklahoma, had an idea. Ray was then the Region’s RE and was also a member of the Horseless Carriage Club. He had heard there were a few sports cars coming into Oklahoma City so he passed the word that he would have a gathering at his farm on November 15th for any and all sports cars, antique cars, specials and any other different and interesting forms of transport. It was quite a gathering. Mark Huckins showed up in his MG Tourer. Perry McArthur in his TC, Pete Young in his XK-120, the Stewarts brought their SJ Duesy, and the 1911 Mercer. Utter rolled out and polished up his 1925 Rolls and the 1931 V-16 Cadillac. Someone had a Cord. Mr. Samson from Tulsa came over with a 1904 Myers, Another couple arrived in a beautifully restored 1930 LeBaron Chrysler Imperial coupe. Bobby Ruedy drove over in his 1926 Ford “T” coupe. There were a lot of interested people about, and for the most of us, it was our initial opportunity to get together with others having a mutual interest. Doe Harris, (our present RE, and at that time the only other SCCA member in Oklahoma ) and Ray Utter got together late in the afternoon and decided that the thing was such a success we should have another one in the Spring. We would have it at Doc’s place’ in Yukon, which is a dentist’s paradise just nine miles West of Oklahoma City. His front yard would be just right for a parking area. We could probably get fifteen cars on it. We had four cars. Doe Harrris’ green TD MkII, Paul Chapman’s red TC, Justin Smith’s (now in the Wisconsin Region) cream TD and Pete Young’s silver XK. The cars stayed in the auditorium for the entire eight days. We took turns manning the affair and probably attracted more interest than any other display. We picked up several new members and were responsible for the potential purchase of a lot of sports cars because the interest displayed was so keen that C. S. Trosper started his Thoroughbred Car Company shortly thereafter. He’s been bearing up under our beefs, gripes, and screams for parts ever since. On the side, he manages to sell a lot of MGs and Jags. By early May it commenced to look as tho we had outgrown Doe Harris’ front yard. So, since we had never put on a really big affair, we figured we had nothing to lose and went overboard. With Richard Kuhlman’s (an MG driving professor of architecture) help we obtained the use of the University of Oklahoma’s extension study center on the North campus and the use of the ramp area on their big airport for a week-end. We planned, prayed, and hoped with invitations going to the Texas gang and all over Oklahoma. Texas, as usual, turned up in full force. We had 40 sports cars on hand, over 120 people for the Saturday night dinner, numerous hangovers and a lot of new friends when it was over. We sat back, real pleased with ourselves, to rest on our laurels and stayed there the rest of the year as far as any organized club activity was concerned.